Mr. N.K. 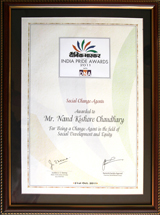 Chaudhary, Founder and Chief Managing Director at JAIPUR, has been awarded the Social Change Agents prize at the inaugural ceremony of the India Pride Awards 2011, for giving employment to more than 40,000 carpet artisans in 10 states in India and being a Change Agent in the field of Social Development and Equity. The annual event is organized by Dainik Bhaskar Group which owns Dainik Bhaskar (“The Daily Sun”), the newspaper in Hindi language with the largest circulation in India, to reward leaders in the public sector organizations. This year, India Pride Awards included a new section: Social Change Agents and Impact Creators. “This is an award which recognizes the hard work of all JAIPUR employees in India and USA and the support of JAIPUR clients from 30 countries. We put daily efforts in connecting thousands of artisans at the bottom of the pyramid with rich markets of the world. Hard times have been there but there is a great satisfaction to see people regaining their dignity and the hope for their families. The carpet industry in India has a great potential to contribute to the empowerment of the poor and the development of the country.” said Nand Kishore Chaudhary, founder and Chief Managing Director at JAIPUR. In 1978, N. K. Chaudhary started working in the carpet industry with only two looms and nine weavers; today, JAIPUR has a consolidated network of more than 40,000 artisans in 10 states in the northern part of India. By offering fair wages and working on a business model which allows the integration of artisans in the production chain, JAIPUR is seeking to improve their quality of life. Jaipur Rugs Foundation, JAIPUR entity and non-profit organization, further catalyses sustainable livelihood for the artisans through rug weaving training & educational programs. India Pride Awards 2011 has recognized more than 30 members of civil society that have been able to make a positive difference at different levels of society. Present at the ceremony held at Hotel Taj Palace in New Delhi, Jairam Ramesh, Rural Development Minister of India said: “Awards for individual contribution will definitely inspire the people, especially the youth of India to work for the society and will further consolidate in a platform for collaborative development”. Since 1994, JAIPUR has received more than 15 awards either for its social mission or for the innovations in the design of its diverse range of rugs and carpets. Ernst & Young “Entrepreneur of the Year Award 2010-Start Up” is one of the last recognitions. Here are more details.